There must have been a scaffolding frenzy today as when I arrived at 3.15pm inside the church was in darkness and a platform has been erected on the other side of the nave obscuring all light from the windows. The last statue has also been safely removed and Brett, from Stepnell, has been busy with a power tool (it’s technical name escapes me now!) 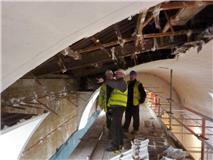 and is cutting square pieces out of the ceiling, bit by bit, and gradually revealing the roof space. These ceiling sections will then be broken up, dropped down the chute which is now in place, in to a wheel barrow and transported out to the skip. Brett tells me that he believes he has an entire skip-load of twigs and small branches which must have been brought in by the pigeons and crows over the years. The structural engineer was also on site today (see photo) to assess the situation and finalise arrangements for the propping of the roof. Sam assures me that work is progressing well and and once lighting has been installed tomorrow, work will continue to bring the ceiling is down. There is lots of activity planned for tomorrow and the Stepnell team will be working for part of the weekend to ensure the project stays on track so keep up with the latest news here! This entry was posted in Project Updates and tagged Ceiling, Phase 1, Scaffolding. Bookmark the permalink. My dads the site manager (Sam) x hope he’s doing a good job for you 🙂 ! !